We have the perfect solution for your individual iPad® mounting requirements. 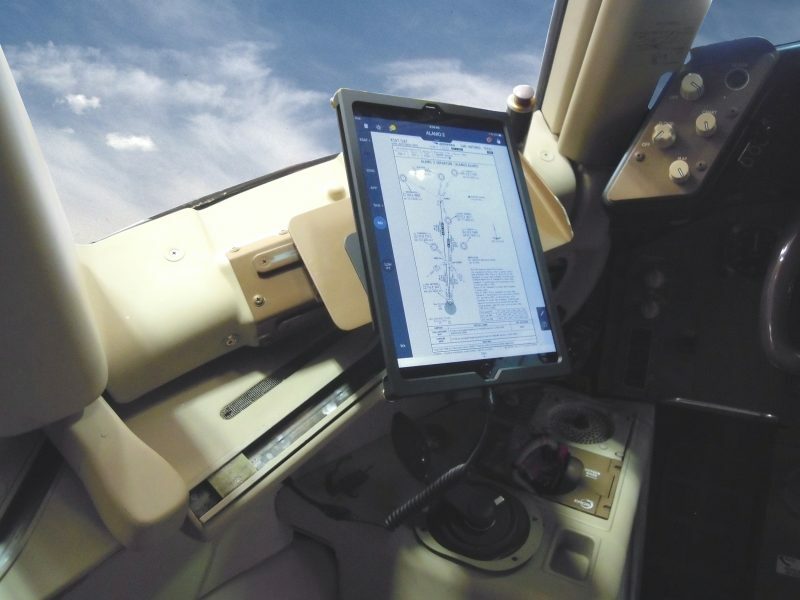 ABC Completions holds FAA, TCCA and EASA STC certifications for the installation of the iPad® Cockpit Mounting System as a Class II Electronic Flight Bag (EFB) on the Global series airplanes and also hold FAA STCs for the Falcon 2000 and Boeing 757 aircraft. Installations are certified for all phases of flight. This provides access to electronic terminal procedures and enroute charts from compatible software. The features of the iPad® mounting system include: full travel in tilt (up, down), sweep (left, right) and a 90 degree rotation. These features take advantage of the automatic portrait and landscape function of the iPad® when using Jeppesen’s charting software. 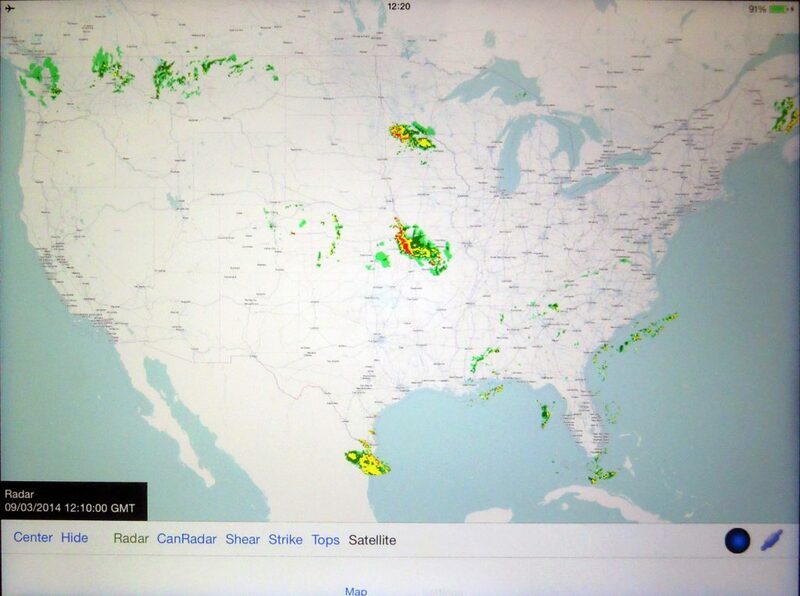 This system also provides graphical SIRIUS/XM® weather for North America using a compatible SIRIUS/XM® Weather receiver. This system is able to display video from compatible Enhanced Vision Systems (EVS), and up to four (4) security cameras. The ABC Completions iPad® cockpit mounting system includes a custom-designed Mount and iPad® Housing. It also includes the DAC International GDC64 Tablet Aircraft Interface Unit (TAIU) that provides electrical power and FMS position data to the iPad®. All associated certification and supporting data ensuring airworthiness compliance is supplied. The system can be purchased as a complete kit or can be installed by the ABC Completions Mobile Installation Team. When an existing ABC Completions EFB mount is already installed in the aircraft and a conversion to iPad® is desired, an ABC Completions-designed Quick Change Adapter (QCA) attaches directly to the existing Esterline/CMC EFB Mount using its locking lever. The QCA can be easily removed and installed without tools. The QCA features a universal joint, allowing the tablet to be adjusted to each pilot’s comfort. The QCA has full travel in tilt (up, down), sweep (left, right) and 90 degrees of rotation These features take advantage of the automatic portrait and landscape function of the iPad®. This optimizes the use of Jeppesen’s charting software. Existing installations also utilize the DAC International GDC64 TAIU. Below is a video to show how fast and easy it is to use the Quick Change Adapter. ABC Completions offers a full range of custom-designed iPad® Housings that are compatible with most iPad® models. Housings are powder-coated and fabricated from aircraft grade aluminium. We carry all iPad® Housings up to the latest iPad Pro 10.5″ model. Our Housing holds the tablet securely in place. 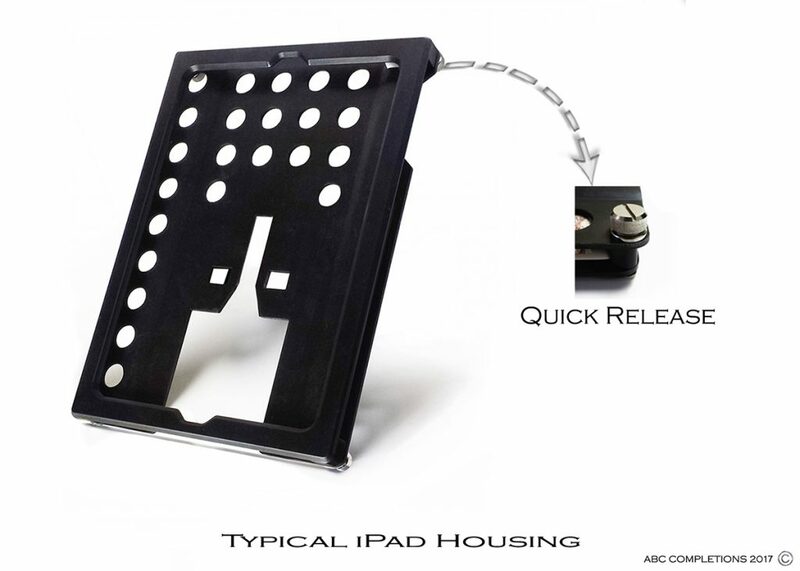 Quick release fasteners allow for fast and easy removal of your iPad®.